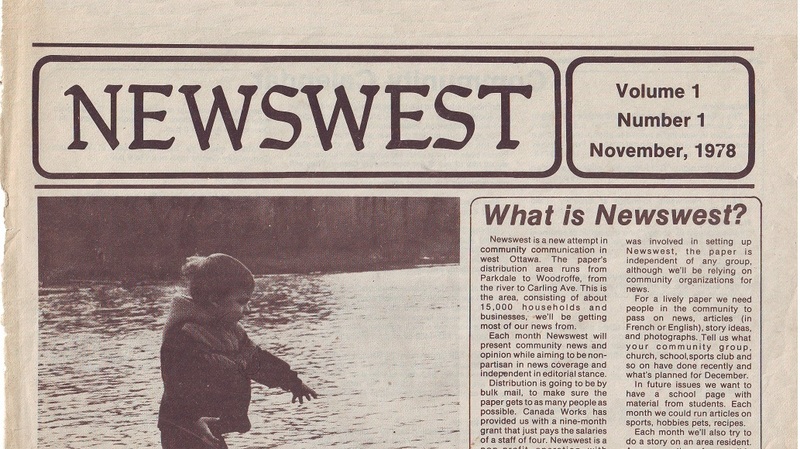 It is 40 years ago this month that the community newspaper Newswest first launched. A small group of community members got together and put together a well-designed and well-run publication that brought together the neighbourhoods of Kitchissippi all in one. There had been a handful of short-run papers that had operated going back to the 1930s, but none had the staying power that Newswest ended up having. Running a local paper at any time is hard, often thankless work, and so it is all the more impressive that in the late 1970s, a group of regular citizens with little or no newspaper experience came together and made the community paper happen. For over 25 years, Newswest succeeded on its own, coming close on a few occasions to shutting down, but it never did. When the Kitchissippi Times arrived in 2003, Newswest was incorporated into the new paper, and it continues to this day, with its own editorial board, writers, content and mission. 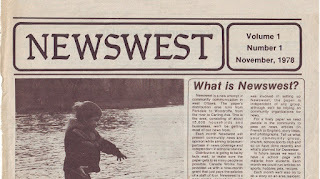 I thought it would be fun to scan and upload my copy of the first ever issue of Newswest, from November of 1978. There is a lot to enjoy in these 16 pages - lots of photos, names from the past, businesses from the past, local history, and more. Shirley Shorter played a key role in bringing Newswest to life out of the ashes of the previous local paper, the Village Voice, and her fingerprints are all over this premiere issue of Newswest. Her emphasis on local history was a key part of Newswest during its first ten or so years, and she appropriately starts things off with an article on Maplelawn and the Cole and Thomson families. Newswest started off with definitely more of a Westboro/McKellar focus, but it would soon incorporate Hintonburg and Wellington Village as well. So click this link to be taken back in time 40 years! Enjoy! New link below replaces the old one which no longer works!